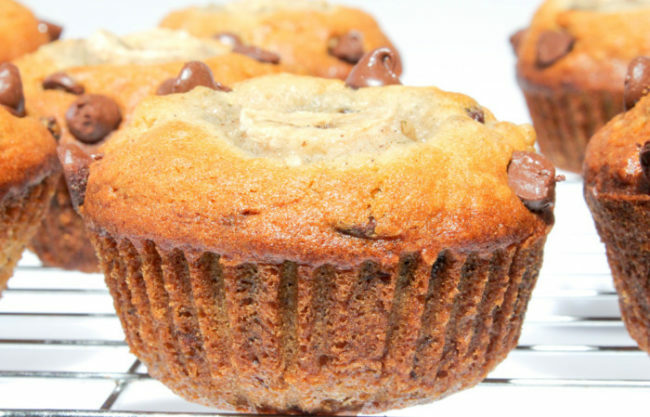 These muffins are bananas. 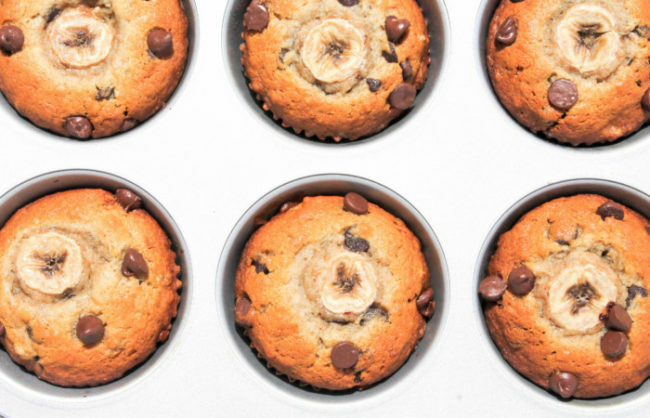 B-A-N-A-N-A-S. We’re going back to the basics with these Chocolate Chip Banana Muffins. Everyone needs a few solid go-to recipes when you find yourself with a bunch of extra ripe bananas that need to be used. Banana Bread Muffins are the lazy man’s banana bread. And that’s a hundred percent my style. I love banana bread but don’t love attempting to bake it and having a crunchy outside and gooey inside. Plus, any excuse to throw chocolate chips into a breakfast recipe is okay with me. 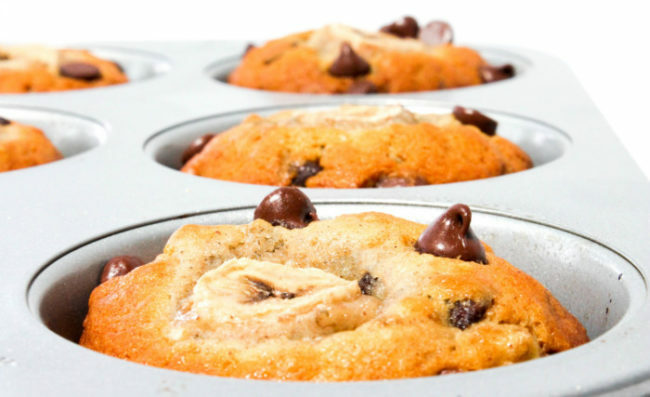 These Banana Chocolate Chip Muffins are the perfect way to start off your day, chock full of ripe bananas and sweet chocolate chips. Over my two weeks of vacation I took advantage of having a giant kitchen and lots of taste testers to whip up a number of recipes, including these muffins. I’ve made Banana Chocolate Chip Muffins way back in the first year of the blog, but the recipe and post was in major need of a refresh. I’ve come a long way from taking photos in my ghetto rented apartment kitchen in Southie with an iPhone4 and trying to use white kitchen cabinets as a solid background. Anyway, a giant bunch of ripe bananas was calling my name so I whipped those nanners straight into this batch of delicious muffins. One of my favorite fellow foodies The Baker Mama always slices an extra banana to put on top of her banana breads or muffins, so I opted to add that artistic touch to this batch in addition to tossing a few extra chocolate chips on top. Look how photogenic those muffins are! I like to bake the muffins at a higher temp for the first five minutes to give the muffin top a bit of crunch. It is more effective when there is streusel on top, but still gave these muffin tops a delicious crunchy consistency. I’m also a fan of using the jumbo muffin tins so they come out bakery style, but you can definitely adapt this recipe to regular or mini-size muffin tins – you’d just have to watch the timing until they start to turn golden on top. If Jack Johnson tasted these muffins I think he would have been singing about banana muffins instead of banana pancakes. 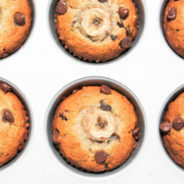 So the next time you find yourself with a ripe bunch of nanners, bake up a batch of these Banana Chocolate Chip Muffins and start your morning off on a sweet note. 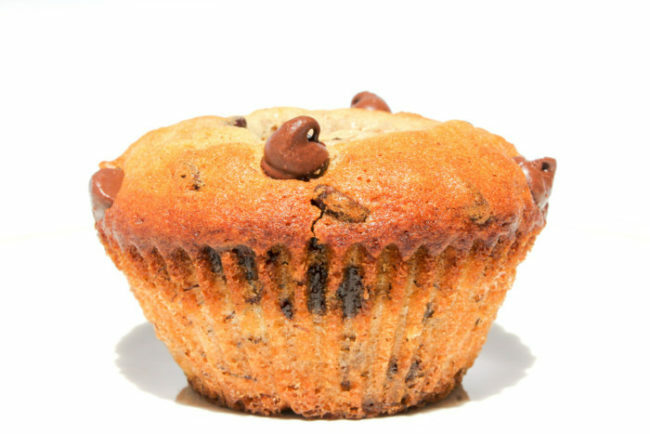 These muffins are the perfect use of extra ripe bananas and made extra sweet with the chocolate chips. Preheat the oven to 425 degrees F. Line two jumbo muffin tins with liners and spray with non-stick spray. In a large mixing bowl, use a whisk to combine the melted butter, granulated sugar, eggs and vanilla extract. Mash up four of the bananas and use a wooden spoon to incorporate into the wet batter. Add in the flour, cinnamon and baking soda and mix slowly to combine. Fold in the chocolate chips. 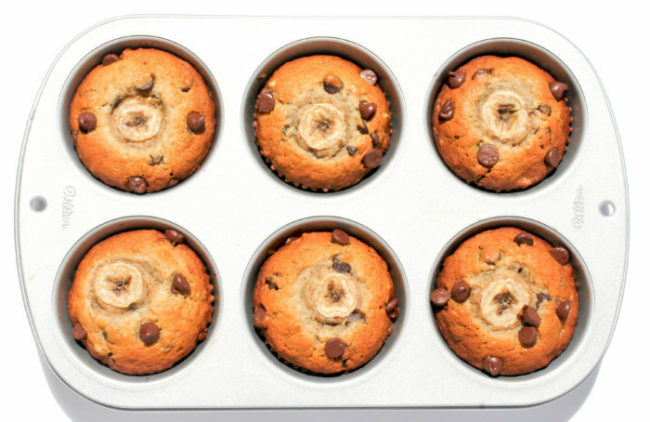 Fill the muffin tins evenly with batter, and top with a slice of banana. Bake at 425 degrees F for 5 minutes to get the tops a bit crunchy, and then reduce the temperature to 375 degrees F for about 15-20 minutes, until a toothpick comes out of the muffin center clean. Enjoy!